The Doctor Told The 19-Year-Old Girl That She Would Not Be Able To Give Birth Because Of Her Illness! But After The Ultrasound, He Closed His Mouth! Since childhood, Charlene Medlicott dreamed of a big family. Unfortunately, already in the teenage period doctors rendered to the very young girl a disappointing diagnosis. Charlene was diagnosed with Polycystic Ovary Syndrome. Many women suffer from this disease, and cannot get pregnant. In the case of our heroine, she had been warned she would probably never have a family without IVF treatment. When it turned out that Charlene was pregnant, she and her beloved Mark were in seventh heaven with happiness. Later it turned out that the couple will have two children at once. Only then, at one of the sessions of ultrasound, it was found out: in the belly of the future mother, four tiny sisters are waiting for their birth. Fearing for the life and health of a woman, the doctors decided to have a serious talk with Charlene and Mark. The fact is that several twins at times are not always born alive and healthy. In addition, the situation was complicated by the mother's illness. The doctors gave future parents the advice: to eliminate two of the four embryos in order to provide normal births for the remaining two. After discussing, the young couple rejected the offer of specialists. Charlene and Mark decided to take a chance, but give all their daughters a chance to live. Already on the 24th week of pregnancy, the woman had to be hospitalized. Six more weeks she spent in the hospital, and then successfully gave birth to four girls! On December 11, 2011, she gave birth to 3lbs 6oz Gracie-Lou, 3lbs 4oz Rosaline, 2lbs 9oz Amalia-Rose and 2lbs 6oz Eveylynn. Today, however, Charlene remembers the words of her doctor with a smile. At the age of 19, the girl not only became pregnant but also successfully gave birth to four babies at once. 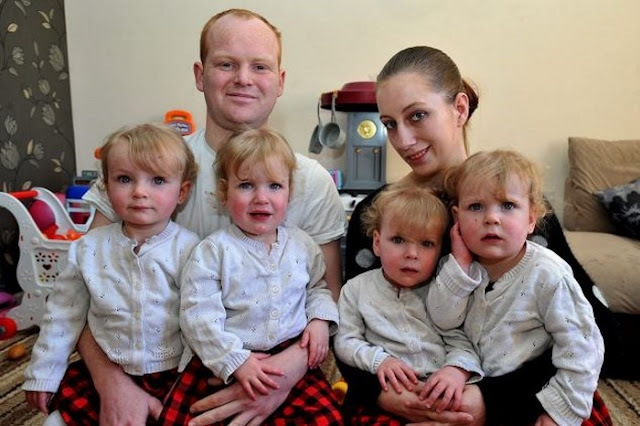 Now she's Britain's youngest mother of identical quadruplets. Two months babies had had to be in neonatal intensive care. Fortunately, everything worked out, and the "magnificent four" went home to happy parents. Today Charlene and Mark don't doubt that they did the right thing when they decided to ignore the old medical advice. The young mother shares her impressions: it turned out to be much fewer problems with four daughters than her friends predicted. Little twins were very calm children. Besides, Mark helps Charlene in everything. After the birth, when the infants got stronger, and their mother finally recovered from the ordeal, the young couple was married. But even earlier they arranged a baptism for their daughters.